Have a apple taste testing with the children! Choose different types of apples, both red and green. Above we choose Granny Smith, Red Delicious, Golden Delicious, and Gala. 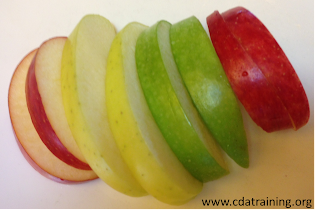 Cut the apples into slices and allow the kids to try each kind. Talk with the children about the different colors, the taste of each apple (sour or sweet? ), and which one they liked the most.